What’s The Difference Between All-Purpose and Cake Flour? Now that fall is on it’s way, I’m reminded of how much I enjoy baking. There is nothing better than baking bread on a cold and cloudy Sunday afternoon! For that reason, I’ll be doing a series of posts that cover some simple baking basics. First up: Flour! Generally speaking, flour is made up of hard and soft wheat. Hard wheat contains more protein and gluten which produces more structured and chewy breads and cookies. Softer wheat on the other hand has less protein and gluten which produces lighter, more tender structures. All-purpose flour is used like the name suggests—for many purposes. All-purpose flour is a combination of soft and hard flours which makes it ideal for a variety of baking and cooking needs. Cake flour is simply soft wheat flour which will produce soft, tender, and crumbly cakes. Bleached flour has been treated with bleach to whiten the flour. 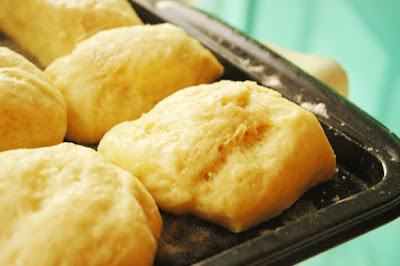 Some bakers suggest that this weakens the protein content of the flour and that it also lowers the nutritional value. – If you need all-purpose flour and have only cake flour on hand, substitute 1 cup plus 2 tablespoons of cake flour for 1 cup of all-purpose flour. – Bread flour has a higher gluten-forming protein content, making the dough nice and elastic. This makes it ideal for bread-making. I am amking a red velvet cake this weekend,first time,and I have read mixed reviews,alot of people say theirs came out dry,and I am trying to figure out if it was because they used all-purpose instead of cake flour. If that wasn't the problem,what can i use or do to make sure my cake will be moist? I would venture to say that the cake flour will be better but make sure that you are measuring it correctly. Often times people pack the flour into the measuring cups which will add TOO much flour producing a dry cake. Also make sure not to over bake. I always check my cakes 5 minutes before the recommended times. Good luck! Thanks for the information…….Will I be able to easily find cake flour in my local supermarket?